← Architect, Interior Architect, Interior Designer, Interior Decorator? The debate. As we approach the first semester of year II of Interior Architecture, I am painfully planning lessons. I am also planning for a 10 week course at Leeds City College, where I am to teach ‘An Introduction to Interior Design’, for those keen on exploring the potential of planning spaces. Both courses hold different outcomes, one set of students are working towards their degree, the other set of students will hopefully be able to use the skills learnt to use interior design as a hobby and for their home refurbishments. One important skill that will be emphasised and practiced on both courses are drawing skills . I have realised from teaching that students very rarely sit down with their sketch book and sketch through ideas! Without a doubt, this is the most important skill needed to be a good designer; to be able to transfer your ideas to paper, without sitting down at the computer, is prevalent. So I have been practicing what I preach and therefore arranging drawing tasks to enable the students to understand the potential of sketching their ideas. How many ways can you draw an open box? This helps to demonstrate orthogonal projection drawing techniques. It did take me a few attempts, but I believe the following examples demonstrate my reasons for this exercise. 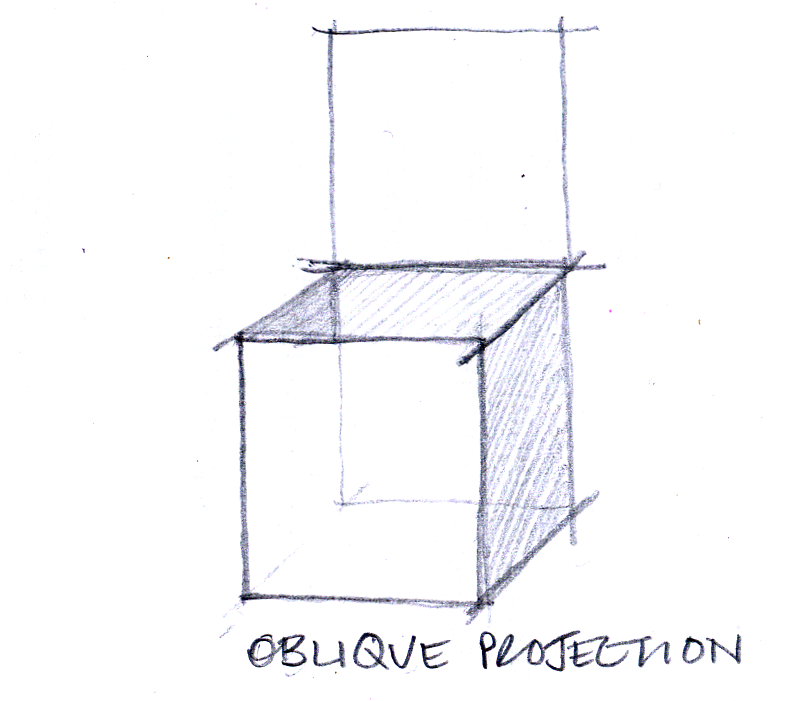 The oblique projection is the most simplistic of the Parallel projection. This was the first example of three-dimensional drawing that I got taught at school. 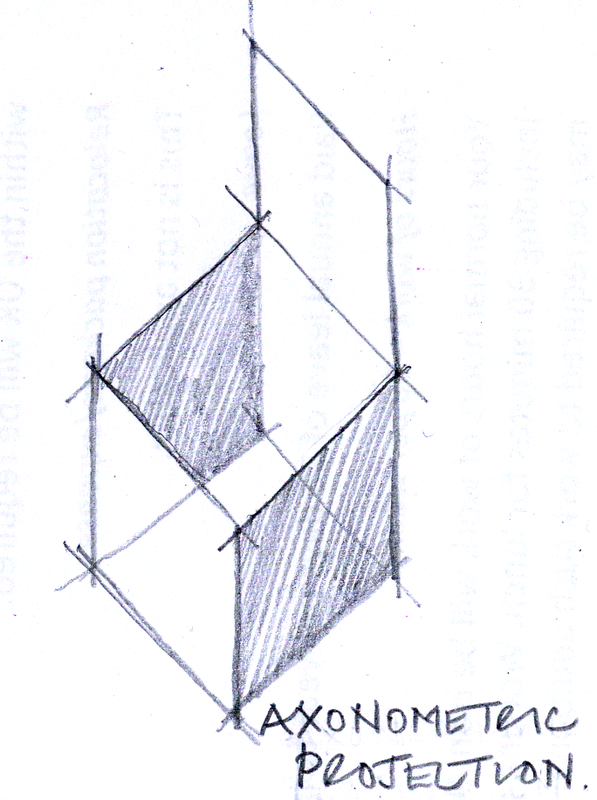 The Axonometric is the true plan of the room, in this instance a true square tilted at 45 degrees to reveal both sides of the object or space. The parallel lines are projected at equal distance, making the drawing look distorted. This example is useful for illustrating how objects are assembled. 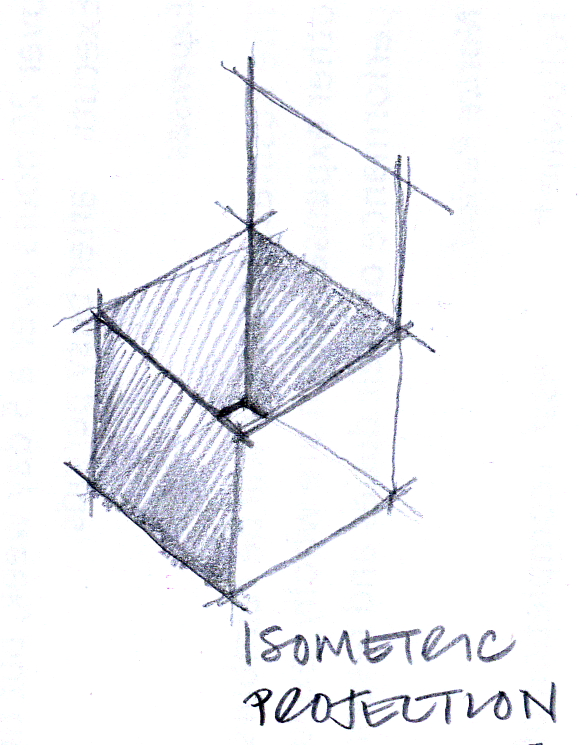 The Isometric, is my personal favorite. An isometric view of an object will provide a view of three sides. It is important to choose the best view to provide the most detail. One Point Perspective’s show the front or elevation of the space or object, the projection lines are that taken to one vanishing point. 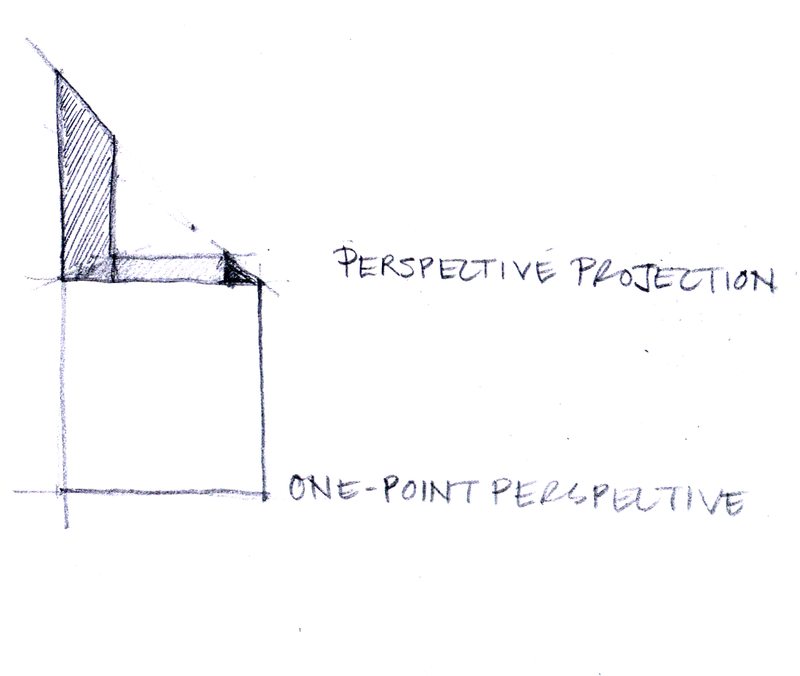 One point perspectives are useful when illustrating a long, thin environment. i.e a corridor. 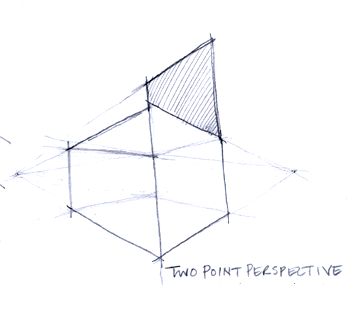 The Two point Perspective, with it’s two vanishing points on the same plane, allows you to view a space on a corner, to show two different elevations. And last but not least . . . . . . 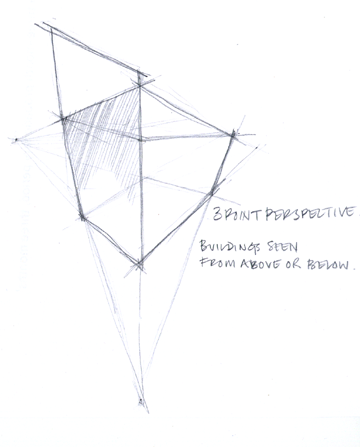 The Three point Perspective allows you to illustrate a building from aerial or worms-eye view. Think of perspective drawings of Manhatttan or an MC Escher painting. The work on thee vanishing points, two on a horizontal plane and one, either above or below, depending on your chosen view. Now, for my students, I will advise that there is a formula to work though to carry out these drawings, but as I am no mathematician, I advise that you trust your own eye, and if it does not look correct then you may need to revisit the principles. This entry was posted in Architect, designer, interior designer, interiorarchitect, technical drawing, Uncategorized and tagged architecture, design, drawing, interior designer, orthogonal, teaching, technical. Bookmark the permalink.